A manager with First Bank Plc at Ilasa-Ekiti in Ikole Local Government Area of Ekiti State, Ayodele Asaba, and four others on Tuesday appeared before an Ado-Ekiti Magistrates’ Court for alleged robbery. The other accused persons were Dele Ajayi, Banji Adedayo, Tajudeen Salawu and Akeem Ahmed. The police prosecutor, Curtis Enabulele, told the court that the accused committed the offence on May 24, 2012 at the Ilasa-Ekiti branch of the bank. Mr. Enabulele told the court that the manager conspired with the robbers to rob the bank. 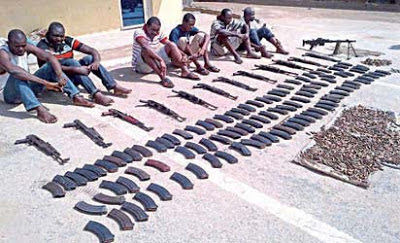 He said four of the accused persons also robbed the Divisional Police Armoury and carted away four AK47 riffles, one Beretta pistol, smoke gummer, cartridges and handcuffs. The robbers, he added, on the same date and place stole N7.833 million from the bank. The prosecutor said the robbers, who were armed with dynamite explosives, unlawfully killed a police officer, Yinusa Yahaya, by throwing the explosive at him.